This is the IDnet-NM ad which ran on Friday, January 7th in the Albuquerque Journal. Renick’s and IDnet’s accusations of “censorship” are absurd, especially given IDnet-NM’s refusal to participate in a public discussion of this topic with mainstream scientists. Do the members of IDnet-NM want “both sides of the debate allowed,” as they claim? NO! They only want THEIR side of the debate to be aired. They will step into the ring ONLY if the fight is fixed in advance. We know that KNME is getting anguished calls from misinformed creationists. How about sending them a congratulatory message? Here’s the Sweetest Message of All for a public television station. Also, check out KNME’s Science Crawl! 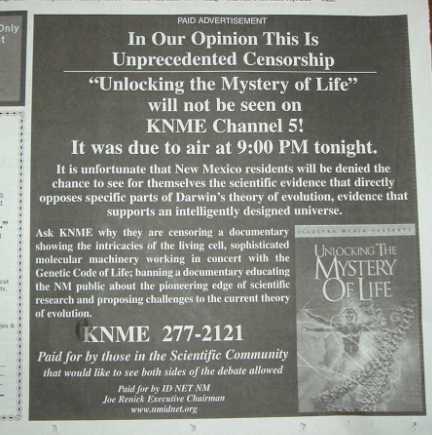 I was appalled by tonight’s [1-5-05] segment on KNME’s refusal to air the “Unlocking the Mysteries of Life” video. I have seen this video myself, and found it to be old-style creationism dressed up in a nice new lab coat. I imagine the creationist community lobbied your station to carry an item about KNME. Of course, they didn’t tell you they were creationists. But that’s who they are, and it was obvious from your extremely slanted coverage. You interviewed Rebecca Keller, representing the creationist position(now renamed “intelligent design” to obscure the religious source), but you didn’t interview even one mainstream biologist or scientist. The list of other cities showing this video exists because creationists have been lobbying those cities hard, as they have been pressuring KNME for years, regarding this pseudo-documentary. Creationists desperately fear modern science, as they feel it is incompatible with their personal religion. (Most denominations have no problem with evolution, however.) And so, creationists hound public TV stations to show their material to the community, here and elsewhere. And they’re hounding YOU to make them out to be Martyrs. And you fell for it! * the producers of the “Unlocking” video also produce Christian films about Easter, the Passion, Hell, etc. …. * World Net Daily, a major Christian website, is rallying its troops against the tyrannical KNME…. You owe your viewers an Update on this story. Your coverage was clearly biased toward creationists, a fringe position in science. You need to talk to some real scientists, biologists, etc. I can get you connected with hundreds. Thanks, and please - write or call. You wanted Feedback - you got it!